I obviously do not have as much equipment as many other radio amateurs, but I can do my thing very well. Just after I passed the exam and received my Novice registration, I started, cheap, with the Ranger RCI2950, a 25W mobile rig for 10m. The RCI2950 was sold, and a second hand Kenwood TS-440SAT bought. With this radio I became quite active on 20m and 40m. I saved some money for a more modern radio. Curious about VHF, I traded in the TS-440SAT and added my savings to buy an Icom IC-746Pro. This radio includes HF, 6m and 2m. A tragic event. On holiday in Spain, our motor home (RV), with all our belongings was stolen. We parked on the parking lot of a McDonald’s in the town of Sant Boi Llobregat near Barcelona, just to get an ice cream. It took the thieves only 5 minutes to bypass the alarm system. My IC-746Pro was also in the motor home. Back home we had big issues with our insurance agent who got us the wrong insurance. My radio was not insured… With the money I had saved to buy a SteppIR BigIR vertical, I went looking for a new transceiver. I had three radios in mind to replace the IC746-Pro. I listened at and worked with these three transceivers at a radio shop. By far, Kenwood was the nicest radio to listen to on HF (my favourite part of the spectrum). So nowadays I own a Kenwood TS-480HX, the 200W version. The original MC-43S hand mike sounds incredible, like a very expensive brand. So I mounted it on a boom. The transceiver is powered by two SPA8230 23A switching power supplies. The radio and two power supplies are mounted in the attic, just under the roof. Big advantage of putting the radio up there is that I use very short feed lines. The control head (with internal speaker) and microphone are connected through two 15m CAT.6 AWG24 UTP network cables. With a PC in the shack I can also control the radio with Kenwood’s ARCP-480 software or HRD. To control it, I use 15m of old CAT.5 AWG24 UTP cable, with two RJ-45 tot DB15 adapters. Two 15m cables are used to transport audio between PC and radio for digital modes. When my Asus netbook is connected to the internet, something wonderful happens. I can remote control the radio using the Kenwood software over the internet with any other computer, anywhere in the world. Audio streams (Tx and Rx) are controlled through a VoIP connection, like Skype or Kenwood’s ARHP-10/ARVP-10 VoIP software. As I lost VHF with my Icom IC-746Pro, I searched for a cheap broadband receiver. I was astonished by what radio amateurs did with a cheap RTL dongle, a Raspberry Pi and free SDR software. So I bought a dongle at dealextreme.com and a Raspberry Pi at a local shop. Now I have connected the RTL dongle to the Raspberry Pi. The Pi is programmed as an SDR server, streaming a wide spectrum to a PC running SDRSharp. Living on the outskirts of “downtown”, space for antennas is limited. But still I have managed to put up several antennas, and even my wife aint complaining. 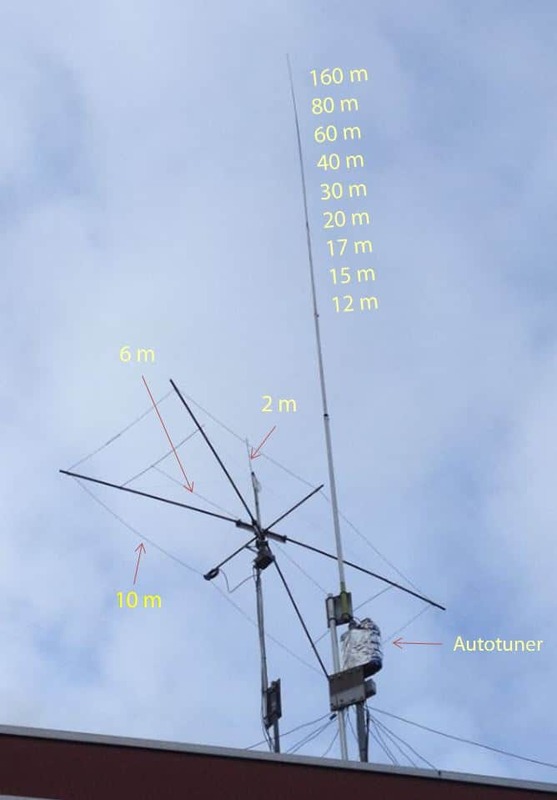 I used to own a Hustler 4-BTV trap vertical, but in 2015 after 7 years in our wet, windy and corrosive climate, it became more and more difficult to get it to perform decently on 10m, 15m, 20m and 40m. Because I also wanted to discover other HF bands, I did something different. No trap vertical or other commercial multiband antenna. Just a homebrew 30ft vertical with a CG3000 remote antenna tuner to do the job. Eight sections of aluminum tubing from 30mm (1.3/16″) to 6mm (15/64″) diameter with the base mounted at 8m above ground make up my homemade 9m (30ft) vertical. It is complimented with four 10m (33ft) length elevated radials, four 6,7m (22ft) length elevated radials and four 2,7m (9ft) length elevated radials. I performs quite well on 40m to 12m. On 80m and 160m it’s electrical length is much lower than a quarter wave, making it radiate at high angles. However 80m brings me outside Europe, on 160m it’s a real NVIS antenna. The 30ft vertical is a poor performer on 10m, my favorite band. With close to one wavelength electrical length, it radiates at high angles which are not useful on this band, so I am using a Moxon to work around the globe. A full size Yagi would have a too big turning radius for my house. PGØDX Henry and PB2B Dave inspired me to build a Moxon. I used special PVC tubing, loudspeaker wire and other used materials to build my own version. 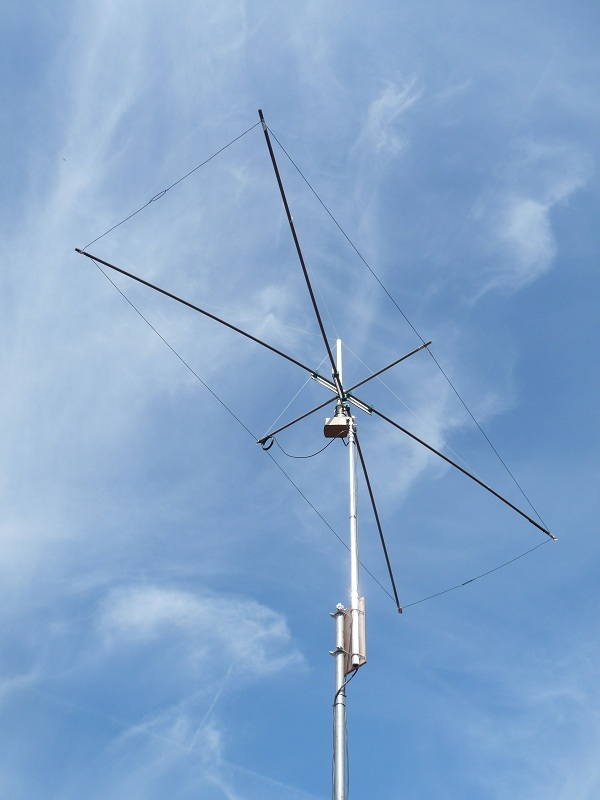 In spring 2013, I put a 6m wire dipole in the Moxon. It performs quite well with excellent front/back ratios and up to 4 S-units more signal compared to a regular 1/4 wave vertical! Later I added a 2m vertical dipole on top which is connected to a RTL dongle used as cheap SDR receiver. Works very nice for listening to local chatter on VHF. The Moxon is mounted at almost 13m from the ground. Here is a picture made just after it was mounted on the roof. But without the later 6m and 2m dipole additions. 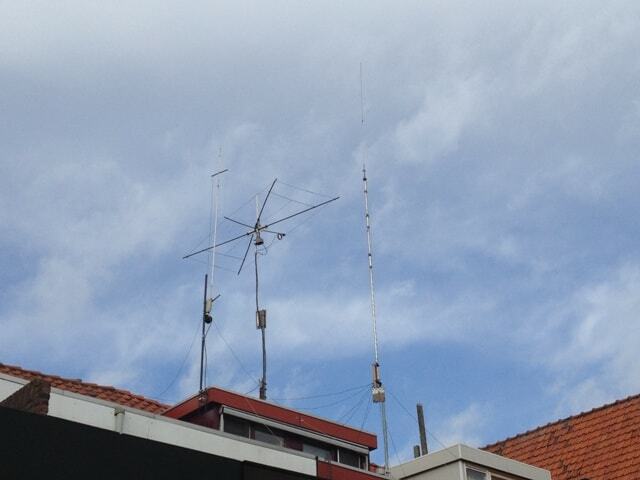 My old Hustler 4TBV, with on the left of the Moxon my old homemade two band 12m + 17m vertical. This is a project which is still theory. It’s a vertical made out of a conductive liquid which can be tuned from 10m to 40m by levelling the liquid in a vertical tube or hose. You can read about it in this blog post.